A city known for several aspects of its rich culture- be it the architecture, the cuisine, fine arts or the art of embroidery, Lucknow has always taken pride in blending the old with the new. There is a hint of the grandeur and magnificence that is effortlessly inter-weaved into everything– and the Lucknow Metro is no exception. 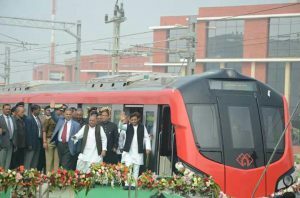 We remember the day when Lucknow got the first experience of a Metro Ride and the proud moment when the Lucknow Metro rolled out for the first time. No doubt, it created the foundation for future pace of the esteemed Metrorail project started by Shri Akhilesh Yadav, as the Chief Minister of Uttar Pradesh during 2012-17. When the commercial run for the Lucknow Metro was flagged off on 8th March, it was an important milestone for the city & its residents. It has been close to 5 years since its construction began and now that it has hit the 2nd phase, the excitement simply refuses to settle down. 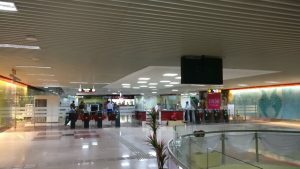 Metro’s impact on the city is quite apparent already and Lucknow which boasts of a population of over 3 million is finally getting a taste of having its apni metro. Still, speedy modernisation has not swayed Lucknow away from its age-old roots and it has managed to hold on to them despite the rapid expansion. Several elements that have been incorporated into the metro’s design – right from the coaches to the metro stations are deeply inspired by the city’s rich heritage and in a lot ways, are a tribute to the legacy and charm that Lucknow is so famous for. As it wheels through the skyline of the city and invades the grounds of the iconic Hazratganj, the spirit of Lucknow still remains intact. Of the 19 elevated and 3 underground stations, the Hazratganj station was purposefully planned as an underground station so that the 200 year old market’s Mughal and British- style architecture remain s unperturbed. In fact, it is the look and style of Hazratganj that influenced the use of the colour Black in metro’s design. So Ganjing not only remains the same but gets even better and more accessible now. This state-of-the-art Mass Rapid Transit System is another step forward for Lucknow to become a Smart City. It will not only enhance mobility and reduce the vehicular traffic but as the state-capital is known for its Baghs, the Metro too, has ensured a decent green cover through-out its route unlike other cities. There are trees planted along the elevated tracks, thus the city will have some fresh air from all the pollution being churned out. The 23 km long, North-South corridor forms the Red Line and is available from 6 AM in the morning to 10 PM in the night running at intervals of 6-7 minutes. There are many other things that make the Lucknow Metro stand-out from the other metros popping in the country. This essence reflects in the murals and paintings of Lucknow’s rich architectural heritage that are installed at the various stations giving them a very upbeat, energetic and lively vibe. 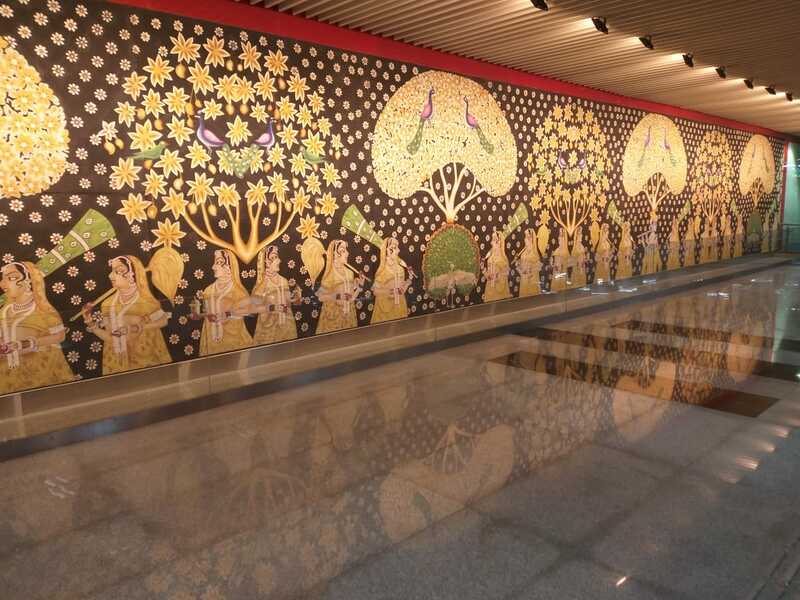 The concourse areas of the Hussainganj and Hazratganj stations are adorned with stunning art panels illustrating the different mudras of the classical dance form Kathak, which finds its origins in Northern India. 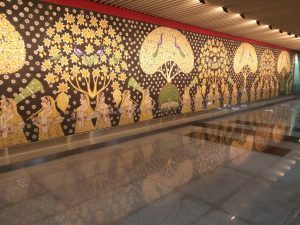 Lucknavi culture is of course incomplete without the art of Chikankari, then how can it not be a part of the metro which is changing the city’s public transport system. Huge panels depicting this intricate craft add to the exquisiteness as the golden-coloured patterns on the metro coaches represent the Chikankari craftsmanship. Integrating more facets of Lucknow’s architecture, the front design of the metro is inspired by the Lakhnawi heritage architecture. Even the logo of the LMRC has a semblance to the Rumi Darwaza. With such a contemporary transport system available to the public, it is our moral responsibility to take care of it. In a matter of few days, problems regarding encroachments and illegal parking around the stations have already started cropping up. We must be cautious enough to follow the guidelines not just inside the metro but outside it as well for maintenance of the facilities that make our lives better. All said and done, given how smoothly the Lucknow Metro has blended in; the second happiest city in the country now has another reason to smile and say, ‘Muskuraiye Ki Aap Lucknow Mein Hain’. 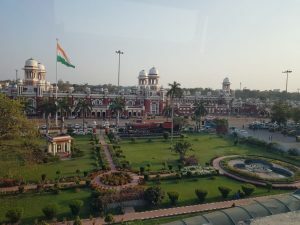 That’s the picture of our majestic Charbagh Railway Station taken during a metro ride by a Proud Lucknowi – Devika Singh.